I hate to post a project with just a few photos…and NONE of the build, but it’s the best I can do, ya’ll. My wife has become quite the backyard butcher, since we live on a goat and pig farm, and is striving to learn more! However, she was working on a disposable plastic cutting board. The horror! There were a few knots in the pine which needed to be filled, and two table saw mistakes as well. A little black sawdust and epoxy, and lots of sanding came out pretty nice. I’m not sure I’ve seen pine cutting boards en masse, so I’m not sure how long it will stand up? Hopefully, long enough to make another from hardwood! LOL. Flattened with cabinet scrapers, ROS, and finally a block sander to 800 grit. The finish is Howard’s Orange Oil from the Borg, nice and food safe, and also adds a decent glow to the Southern Yellow Pine. Final dimensions are roughly 15×11” and a full 2” thick. It’s not a cutting board we put away at that size, but it doesn’t move when used, either. Simple 1” squares of non-stick shelf liner were added to the base to ensure that. 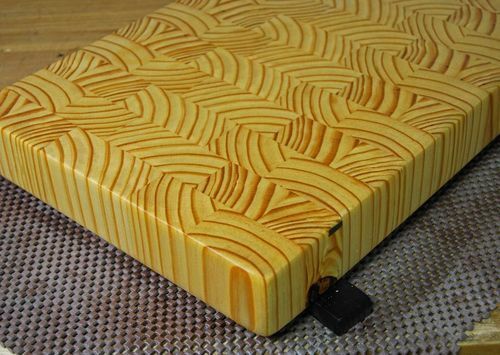 This was actually my 2nd end grain board…and I’m in the mood for more now! I love the grain in that. Very well done. The grain effect is wild, nice work. It’s very pretty, but I’ve always read that pine and other soft woods are not food safe because the grain is too loose. Might want to read up on it a little. I have seen boards that have similar grain patterns, I think they were teak. I like the grain patterns on it as well, very nice. Not sure how it will hold up to cutting – but it sure is pretty. Well done. Poor wood choice for a cutting board. The grain pattern is amazing!! -- Honey thats not a mistake, it's a design feature! 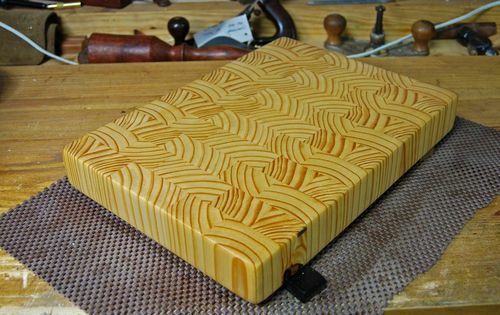 Have used pine for cutting boards for years. They are perfectly safe as long as they are cleaned properly, i.e. scrape clean and wash with soap and water. Also can be left in the sun occasionally as the UV light will kill off any bacteria that remain. My current pine chopping board is over 15 years old. If I was ever curious about theboardsmith, after the snarky comment above, I’m not anymore.